The view from not my house. I live in Los Angeles. This entire town is an attraction… for someone. It’s not for me, at least, not in the traditional sense. People come here from all over the world to bask in our sunshine and stare at things. These things that they stare at are generally things that I don’t even notice. I view the entertainment industry as a minor inconvenience, not a wonder to behold. For the most part, I couldn’t care less about the new A-List celebrity movies or who won an Academy Award. Film crews shooting on location are an annoyance, e.g. how far do I have to drive out of my way this time because some stupid film is being stupidly shot? I avoid Hollywood like the plague whenever there’s an awards show or event. I have never even been to that new monstrosity they built at Hollywood and Vine. I avoid tourist areas like most people avoid listening to batty old Uncle Ernie tell the same story for the nth time at Christmas dinner. I have less than zero desire to be an actor. I don’t want to be famous. I don’t want to get discovered. I don’t even like most of the movies that are made here. I hate most of the rehashed claptrap that comes out of Tinseltown. Why do I live here then? Is it some sort of self-loathing penance? Au contraire, mon frère. I hate the touristy areas of Hollywood, but Los Angeles is so much more than just that. 365 days a year, 7 days a week, 24 hours a day, you can find anything your little heart desires and even things you never even thought of before. It’s 4AM on a Tuesday and you’re craving Lithuanian food like your Grammy used to make. You might have to drive an hour for it, but you can find it. You just read a magazine article about an artist and you’d like to see some of his work in person. Sure, no problem. You could spend a year just visiting all the galleries and museums in this burg and still not see everything. Would you like to visit the ocean in the morning and go skiing in the afternoon? We’ve got you covered. It’s 8PM on a Thursday and you’re jonesing for some bluegrass music like they make back home in the Blue Hills. Sure, there’s a bluegrass ensemble complete with a fiddle and a banjo playing in Encino for a $5 cover. Every band you’ve ever heard of, and many more that you haven’t, has played and will play in Los Angeles; hiding in the shadow of the film industry, it is still the music industry capital of the United States. Bands, not just actors, come here to get discovered. That, my friends, is my Los Angeles. The broad selection of everything and anything is why I live here. Granted, most of the time, I go about my daily life driving from Point A (home) to Point B (work), and don’t really take advantage of everything Los Angeles has to offer. Most of the time, I have blinders on and don’t go a-rovin’ too far afield. The thing is, just knowing that it’s all there whenever I want it is comforting to me. I could get in my car right now, drive west and be at the Pacific ocean within the hour. I could drive east and be in the mountains in roughly the same amount of time. If I kept going east, I’d be in Las Vegas. I could drive up north and see real forests like they have back east and redwood trees bigger than my house. I could drive south, past Disneywhatever, and visit Mexico. Everything I could ever want is right here in this town or near at hand. I’ve been to a few of the tourist traps, usually when I have company in from out of town. I’ve visited all the major museums and a lot of the galleries. I’ve been to the Chinese Theater and walked down most of the walk of fame at one point or another. 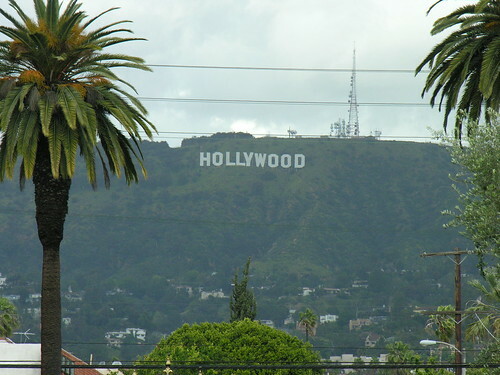 I’ve seen the Hollywood sign up close and personal. I’ve been to the Griffith Park observatory. I’ve been to Koreatown, Chinatown, Japantown, Thai Town, Ethiopian Town, et al. I’ve been to Olvera Street. I’ve walked out on the Santa Monica Pier. I’ve eaten chicken and waffles at Roscoe’s, pastrami at Langer’s, French dip at Philippe’s, steak at The Pantry and a hot dog at Pink’s. Most things in this city are transitory. Residents come and go. Movies come and go. Buildings, sometimes entire city blocks, disappear overnight. Even the very history of Los Angeles mutates. What was there last year, isn’t there today. This city is constantly shifting, expanding and reinventing itself. It bulldozes history and builds right on top of it. In another 30 years, that new building down the street will be torn down for something newer, better, shinier. So, when something does stick around for a long time, like Langer’s Deli, it gains a sort of infamy. It is revered and treated with respect. It will never change because it has passed the point of no return and because we won’t let it. In the same way that any food, music, art or entertainment is available to you at a snap of the fingers, so are all the horrible stereotypes. If you come here looking for that fake tanned, fake boobed, fake blonde stereotype, you’ll find it. If you think Hollywood is glitzy nightclubs, strobe lights and $15 dollar well drinks, you’ll find that, too. If you think LA means the Hollywood sign, bad traffic and film shoots, you can’t help but run right into it. If you come to LA to become a rich and famous actor against all odds, you will find countless others like you. When people come to my town–after a dozen years, it is my town–and only see the surface things like those that I described above, it makes me sad and angry. It makes me sad that someone would spend time here and only scratch the surface, only see the things they’ve been taught to see from the films and television and pop culture. It makes me angry because they have no right to talk about my town without getting to know it. There was a Cracked article not long ago that infuriated me and everyone else I know who lives here because it could not have been more facile, and frankly, offensive. I might find it highly amusing when people like Mr. Brockway fail to realize that their continual condemnation of the superficiality of Los Angeles is superficial itself…if I wasn’t so busy having my teeth whitened for my head shots. That article postures weak stereotypes without so much as an passing interest to investigate the truth. That kind of glib, black and white analysis–on a public platform no less–just will not do. However, if it keeps people who are quick to volubly expound on fallacious conclusions away from Los Angeles, so be it. We don’t need more people with glossy expectations to come here and make brushstroke summations or get upset when they find their preconceived notions to be true or untrue, depending on their limited experience. You can’t talk about this town one way or another until you’ve lived here a year. She won’t show you who she really is until you prove that you’re here to stay and not here for some flash in the pan celebrity adventuring. On the other hand, if you come here with an open mind, not expecting anything really, if you come here just to experience the sheer vastness of it and all the possibilities and diversity that its size presents, then you will find it. If you’re only interested in star maps of homes in the hills, souvenir shops and the walk of fame, it’s here for you, but then you’re missing out on the rest of what this city has to offer, which is absolutely everything. I live in Los Angeles because we will never run out of everything. Posted in movies, open letters and tagged celebrities, Los Angeles. Bookmark the permalink. My in-laws love Vegas, I have zero desire to go there too. Except maybe the food. Well at least you live in an interesting town. Here in sunny STL, we have the brewery and the Cardinals. I’d like to see some more life pumped into my town, but it is a pipe dream. You haven’t had a pastrami sammich until you’ve had a Langer’s pastrami sammich. The food here is plentiful, varied and excellent. No lie. I fear going to L.A. because I firmly believe as soon get there a major earthquake will occur. Doesn’t make sense, but I feel like it can only be true. Another non-fallacy statement. I have visited St. Louis on multiple occasions. I saw many orthodox Jews, rode a scary elevator, and ate lunch at a reasonably priced restaurant. Those three things have nothing to do with each other. I fear earthquakes too since I still haven’t experienced a really bad one. I don’t like the concept of the ground moving because the ground ought not to move. That said, I’ve experienced a few, and other than the seasickness, there are worse natural disasters to experience. I’ll take an earthquake over a blizzard any day. Some people pride themselves on hating Los Angeles and then somehow expect others to believe they are not racist or bigoted. It is different to hate people from L.A.! It is okay. I no longer mind when I see people spewing hate, they are simply showing me who they are, they are someone I will give zero credibility to and absolutely no respect regardless of where they were born or what city in which they currently reside. I don’t understand all the vitriol for LA. Really, I don’t. Yes, it has its problems, but don’t visit if you hate it. And for frog ‘s sake don’t move to LA. I have a whole post coming someday, this was one of my marital issues. I think it is a learned behavior in many cases, an “acceptable” bigotry that has caché. It is a painful way to go through life and not one I recommend but mindset of many nonetheless. $50 Million or 50 Years?